Foxboro gradually getting its power back | Updated: 10:09 am, Wed Oct 31, 2012. Foxboro gradually getting its power back | Updated: 2:18 am, Wed Oct 31, 2012. Commuter trains back in service | Updated: 2:06 am, Wed Oct 31, 2012. Foxboro rolls into MIAA Tournament | Updated: 12:07 am, Wed Oct 31, 2012. Norfolk Mobile Home Park at 131 Washington St Foxboro Public Schools will open Wednesday after being closed for two days because of the effects of Hurricane Sandy, which cut power to 75 percent of Foxboro’s homes and businesses, according to National Grid. Clean up continues in area after Sandy | Updated: 12:44 pm, Tue Oct 30, 2012. - 1,774 in Foxboro, down from 5,845 late Monday night, out of 7,910 customers. National Grid highlights local problems | Updated: 1:02 pm, Tue Oct 30, 2012. Residents clean up; breathe sigh of relief | Updated: 12:45 pm, Tue Oct 30, 2012. Mass Millions | Updated: 4:59 am, Sun Oct 28, 2012. Foxborough will update its downtown zoning and implement a recently produced affordable-housing plan. 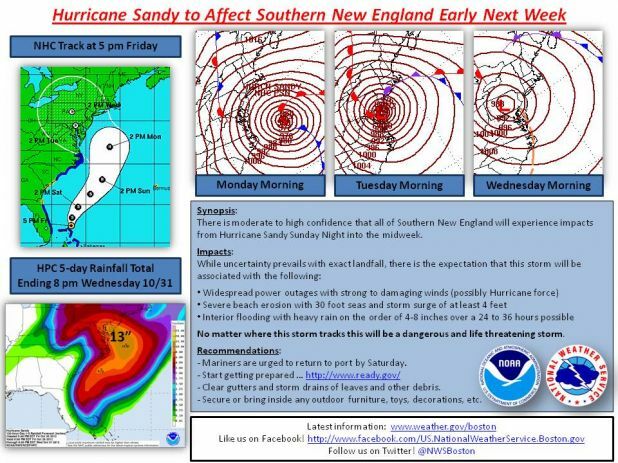 "Frankenstorm" likely in Northeast | Updated: 2:09 pm, Thu Oct 25, 2012. Nov. 3 from 1 to 3 p.m.
Nov. 9, Burrell School at 5:30 p.m. and 7:00 p.m.
Alcohol Service Training Nov. 2. at Showcase Live at Patriot Place from 8:30 to 10 a.m.
Foxboro police nail six bars | Updated: 2:28 am, Thu Oct 25, 2012. 7:00 p.m. on Nov. 14. Lawyer wants casino pledge in writing | Updated: 1:52 am, Wed Oct 24, 2012. Foxboro and Norton had increases. 8:00 a.m. - 4:00 p.m. on Sunday, October 28. Working out of a jam | Updated: 12:41 am, Mon Oct 22, 2012. Meanwhile, the Revolution are out of place in 70,000-seat Gillette Stadium, where they draw only 13,000 fans to suburban and predominantly white Foxborough. The world’s most popular sport has long been a hard sell in the United States, but the tide is turning. Rocking the Patriots | Updated: 1:22 am, Sun Oct 21, 2012. Local men in Scout files| Updated: 2:50 am, Sat Oct 20, 2012. “So far, the Krafts have had a hard time with other land uses at Foxboro largely because of the surface parking and the limited transportation capacity. Few people would currently want to live near Foxboro stadium and even the adjacent on-site retail cannot accept normal customer flows during event days,” he said. Norton to UN: Drop dead | Updated: 11:29 am, Fri Oct 19, 2012. And when they face off Sunday in Foxborough, their new anthems will be available for download. Aerosmith, long associated with Boston, has recorded "Legendary Child" for the Patriots. Childs was in Romney's "binders full of women" | Updated: 10:12 am, Fri Oct 19, 2012. Zoning request sounds Foxboro alarms | Updated: 2:22 am, Thu Oct 18, 2012. Maine quake shakes up area | Updated: 2:55 am, Wed Oct 17, 2012. Brown, Warren tangle over women's issues Updated: 2:43 am, Wed Oct 17, 2012. Maine quake shakes up area| Updated: 2:41 am, Wed Oct 17, 2012. Bielat-Kennedy debate all about fundamental differences | Updated: 12:20 am, Tue Oct 16, 2012. Changing the focus | Updated: 2:41 am, Sun Oct 14, 2012. Warren rips Brown over jobs | Updated: 3:33 pm, Fri Oct 12, 2012. Cabin cruiser owned by Foxboro man impounded in fatal boating accident in Maine | Updated: 9:11 am, Fri Oct 12, 2012. 'The tip of the iceberg' | Updated: 3:37 am, Fri Oct 12, 2012. Time to start over | Updated: 12:01 am, Fri Oct 12, 2012. The towns of Norton, Mansfield and Foxborough say future industrial and business growth depends on the ability to increase wastewater treatment capacity. Norwood Hospital will host its next "Look Good ... Feel Better" event on Jan. 23, 2013. To register, call 1-800-488-5959. 'The tip of the iceberg' | Updated: 2:34 am, Thu Oct 11, 2012. High-profile lawyer enters case | Updated: 1:53 am, Thu Oct 11, 2012. Meditech plans to open 500-employee site in Foxboro | Updated: 4:26 am, Wed Oct 10, 2012. Westwood-based Medical Information Technology, also known as Meditech, has purchased the property at 1 Constitution Way for nearly $20 million. NH Sen. Shaheen lends Warren support in Foxboro| Updated: 11:41 pm, Mon Oct 8, 2012. Sir Richard Branson, Gisele Bundchen spotted at Patriots game | Updated: 11:46 pm, Sun Oct 7, 2012. 2 Hampshire St. in Foxborough Major tenants at 2 Hampshire St., located near the I-95 and I-495 interchange, include manufacturing concern New England Controls, the Federal Deposit Insurance Corp. and Massachusetts Mutual Insurance affiliate Winmark Equipment Finance, according to financial filings. Advantage currently leases space at 300 Foxborough Boulevard in Foxborough. Letter of thanks | Updated: 2:35 am, Thu Oct 4, 2012. FOXBORO NOTEBOOK: Town has emergency handbook in place | Updated: 2:26 am, Thu Oct 4, 2012. FIELD HOCKEY: Foxboro runs unbeaten streak to nine | Updated: 12:24 am, Thu Oct 4, 2012. Family: Sheehan unlikely to face trial | Updated: 2:30 am, Wed Oct 3, 2012. CAMPAIGN NOTEBOOK: Biden's son to campaign in Attleboro for Kennedy | Updated: 1:56 am, Wed Oct 3, 2012. Foxboro voters to take up field | Updated: 12:45 am, Tue Oct 2, 2012. Change in plans for Showcase Live | Updated: 12:41 am, Tue Oct 2, 2012. Revs eye move to Revere Updated: 2:46 pm, Mon Oct 1, 2012. Voters facing life or death question at polls | Updated: 10:40 am, Mon Oct 1, 2012.